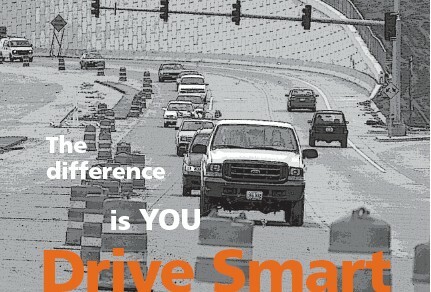 MoDOT has changed its statewide work zone guidelines to improve safety for motorists and highway workers, reduce traveler delays and frustrations, improve statewide consistency in work zones and make better use of MoDOT’s resources. With limited funding and a deteriorating transportation system, MoDOT is focusing more of its resources on preservation and maintenance. Because of this, more work is being done in traffic, meaning more possible conflicts between motorists and workers, as well as more possible delays for motorists. As a result of our efforts, 25 percent of reported lane closures in 2003 were scheduled during off-peak hours; night work was used on 87 projects; 26 projects used road closures to speed up the project completion time; better scheduling of lane closures occurred through the development of a statewide lane-closure notification system; and work during hours with capacity restrictions has been minimized through an online application that calculates hourly traffic volumes. COMMUNICATION: We’ll get the word out about upcoming projects and alternate routes. There are many ways MoDOT is making work zones safer, while reducing delays and decreasing motorists’ frustrations. The department is focusing on three key strategies to improve work zones for highway workers and motorists. To obtain hourly volume tables, contact the district work zone coordinator. You can help reduce the number of those injured and killed in work zone crashes. Plan your trip. Contact MoDOT for lane closure information. Obey work zone sings and flaggers' instructions. Be patient. Work today results in smoother roads tomorrow. Interstates and freeways are high volume multiple-lane routes divided by medians. These routes carry the largest volumes of traffic, and depending on the number of lanes, can affect thousands of vehicles per hour. By using the appropriate work zone guidelines on these roadways, the biggest work zone improvements can be made. 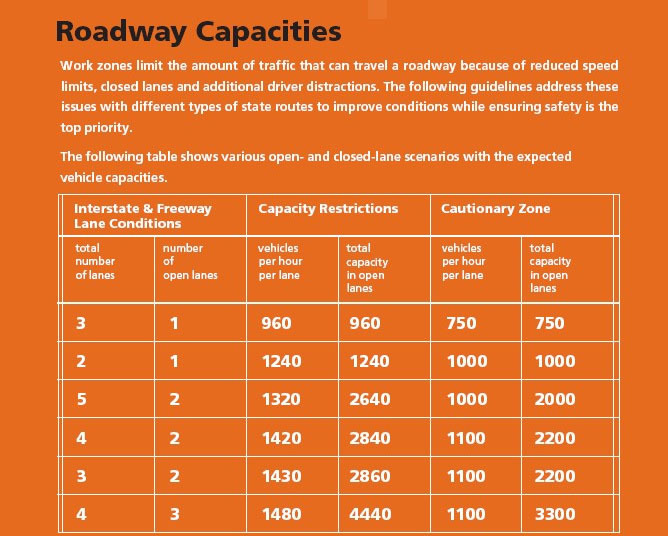 The Highway Capacity Manual provides traffic-capacity information for urban freeway work zones. This information may also be used for rural freeways and interstates. 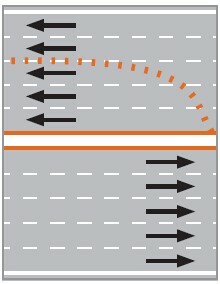 The most common interstate and freeway work zone situation in Missouri is on a route with two lanes per direction, with one closed lane. This results in a maximum traffic capacity of 1,240 vehicles per hour. Strategies to reduce effects on the motoring public should be considered when traffic volumes approach 1,000 vehicles per hour per lane. Where there are three lanes in one direction and one is closed, or where there are four lanes with one or two of those closed, the open-lane capacity is approximately 1,450 vehicles per hour. Strategies to reduce effects on the motoring public should be considered when traffic volumes approach 75 percent of the restricted capacity, or 1,100 vehicles per hour. Where there are three lanes in one direction and two are closed, the maximum capacity is approximately 960 vehicles per hour and strategies should be considered when traffic volumes approach 750 vehicles per hour per lane. 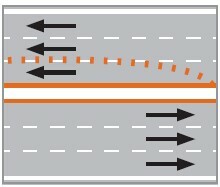 The greatest traffic reductions per lane occur when the situation is most restricted. For instance, if there are five lanes in one direction and three are closed, the capacity of the two open lanes is 1,320 vehicles per hour per lane. Strategies to reduce effects on the motoring public should be considered when volumes approach 75 percent of the restricted capacity, or 1,000 vehicles per hour per lane. Multilane roadways also have more than one lane per direction, however, because most do not have medians, they must be treated differently than interstates and freeways. The work zone capacity of multilane roadways is approximately 1,000 vehicles per hour per lane. Strategies to reduce effects on the motoring public should be considered when volumes approach 80 percent, or 800 vehicles per hour per lane. Work zones for two-lane roadways need to be reviewed on a case-by-case basis. Although these routes have the lowest traffic volumes, they also do not have medians and may have narrower shoulders and more curves than higher-volume routes. Strategies to reduce effects on the motoring public should be considered when volumes approach 600 vehicles per hour per lane. This page was last modified on 5 March 2014, at 09:27.